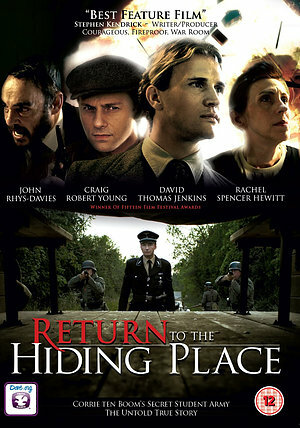 2	3	Return to the Hiding Place DVD	In Stock - Order before 4pm for same day dispatchWant it on Wednesday 24 April? Based on a true story, this sequel to the 1975 film raises the stakes as hundreds of innocent lives are smuggled to safety. Want to discover the next chapter in the story of The Hiding Place? The Nazi regime is spreading through Europe, putting the lives of millions at risk whilst Corrie ten Boom, Holland's first ever licensed female watchmaker, leads a secret resistance made of university students who work together to save the lives of hundreds of Jews. Entering into this army are Piet Hartog and Hans Poley, two bright, young resistance fighters who reject Nazism and go into hiding with ten Boom. Appalled by the horrors the two see at the hands of the German soldiers, they help ten Boom with her dangerous Exodus of persecuted Jews under the noses of their enemies. Risking their lives for complete strangers, the two men learn what differences a small group can make, and the importance of being willing to sacrifice everything. Based on a true story, Return to the Hiding Place brings you back into the tense world of the original film and boasts a stellar cast including John Rhys-Davies (Gimli from the Lord of the Rings trilogy), Mimi Sagadin (Princess Cut), and Joanie Stewart (Alone Yet Not Alone). Return to a world of danger and bravery. Return to the inspiring story that has changed lives through its ceaseless faith. Return to the Hiding Place DVD was published by Timeless International Christian Media in July 2016 and is our 821st best seller. The ISBN for Return to the Hiding Place DVD is 5060049640570. I was totally absorbed, lost in a world of Nazi-occupied Holland. The courage and daring of those who stood up for what is right is just amazing. We know it anyway, but watching this tribute to them really brings it home. The drama of their lives is inspiring. It's not a cheery, happy film, yet it's incredibly uplifting. Definitely worth watching. I'm going to watch it again. The Hiding place was a great inspiring movie, so we started watching "Return to the hiding place" with high expectations. What a dissapointment! It looked very unreal and not professional at all. The story was weird and after about twenty minutes we gave up and literarely dumped the DVD in the dust bin, not wanting anyone else to watch this amateuristic product. An absolute waste of money! Got a question? No problem! Just click here to ask us about Return to the Hiding Place DVD. Are there Dutch subtitles for the DVD Return to the Hiding Place? A:I'm afraid there aren't Dutch Subtitles on this DVD. Thank you for using the Q&A Forum. When resistance fighter Piet Hartog witnesses atrocities toward the Jews, he is drawn by his beautiful love Aty and her Aunt Corrie into the web of espionage and clandestine activities in the Hiding Place, where he joins brilliant young physics student and resistance journalist, Hans Poley, embarking on a nonstop, action-packed hunt through underground tunnels, Gestapo hijacks, daring rescues, codes in windswept old windmills, and stunning miracles in one of history's most famous dramas. Piet, Hans, and their friends navigate a deadly labyrinth of challenges to rescue God's people in their modern-day panicked exodus from death. Climaxing in the true, breath-taking rescue of an entire orphanage of Jewish children marked for mass execution by Hitler's assassins, audiences will both cheer and weep at this exciting, sobering tale.